I spent a weekend with April Rose and Cole Whitt at the Talladega 500 and my life has been in decline ever since. Confidence opens doors that nothing else can. But confidence can also be misplaced. How do you know if the shirt you’re wearing is completely ridiculous until you actually wear it outside the house? Thanks to Speed Stick, at least I had confidence in my underarm scent. Confidence was definitely not lacking for driver Cole Whitt. Even though Front Row Motorsports is at a distinct disadvantage, operating on one-eighth the budget of its competitors and Whitt’s highest previous finishing position this season a modest 22nd, Whitt was ready. A Top 20 finish at Talladega would’ve meant a lot, as Cole explains in our interview shot immediately before the race. 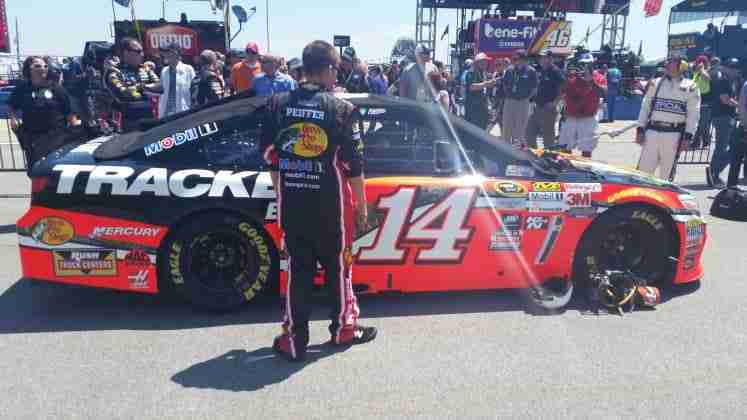 He led the entire field with under 40 laps remaining en route to finishing a career-best 13th in the race. 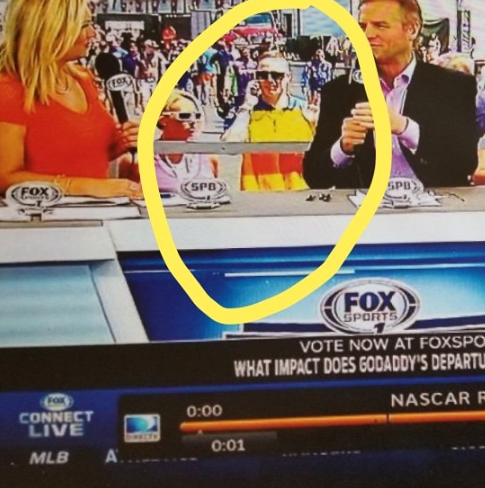 I got a little excited during my interview, and it isn’t completely my fault – there’s so much energy at a NASCAR race, it permeates the grounds and is as real as the guy with the Dale Jr. shirt on next to you. 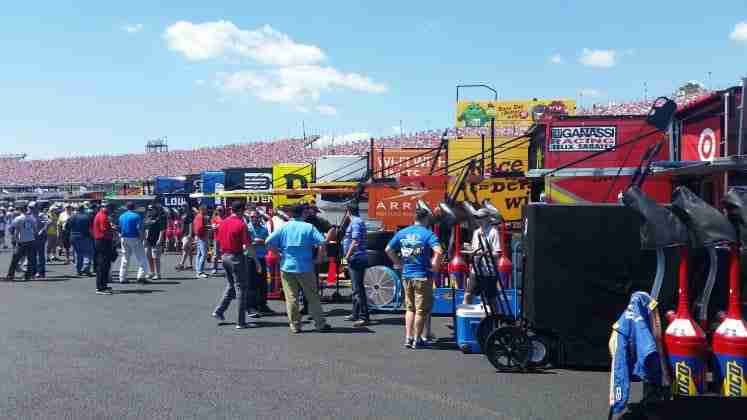 If you have a “Hot Pass,” NASCAR gives fans a level of access that doesn’t exist in any other major American sport. 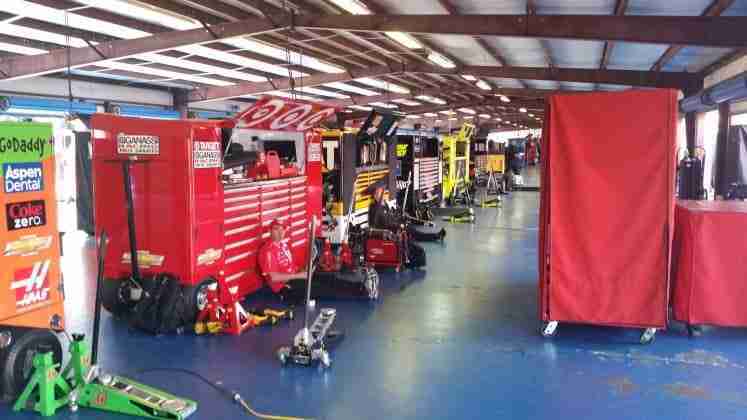 Pre-race, you can walk into the garage that houses each individual team’s equipment and slew of mechanics and pit crew members. During the race, it allows access into the pit while the team is working, and even the booth/box with the Crew Chief. One area that even the Hot Pass doesn’t allow access to is the Driver’s Meeting before the race, but I was able to negotiate my way inside. In true NASCAR fashion, the setup is humble. Inside a small room, rows of chairs you’d find in any church basement are lined up, facing the front of the room. The only hint of pecking order was a hastily composed piece of paper with the words, “Chairs are for owners, drivers, crew chiefs and families only,” duct taped onto a few chairs. I entered the room in the middle of a speech by Ole Miss head football coach Hugh Freeze. Coach Freeze talked about intentionality and the importance of knowing why you are doing what you are doing at all times. It was potentially the most motivational speech I have ever heard, and I only caught the last ten minutes of it. So now what do you do? You could’ve left right then and been happy, life complete. But instead, you decide to go for a walk and take it all in. 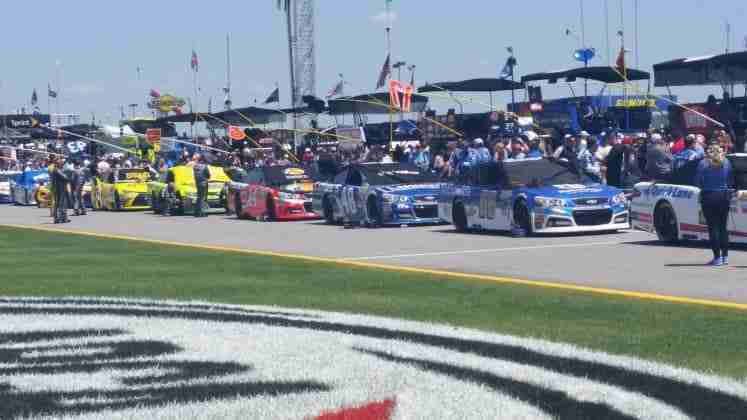 A NASCAR event is a complete spectacle; the race is one aspect of an overall larger entity, the flurry of colors, activity and sounds is a fully immersive experience. Suddenly, as you turn a corner around the garage, you are confronted with a live broadcast of NASCAR RaceDay in progress, directly in front of you, hosts’ backs to you, cameras rolling. 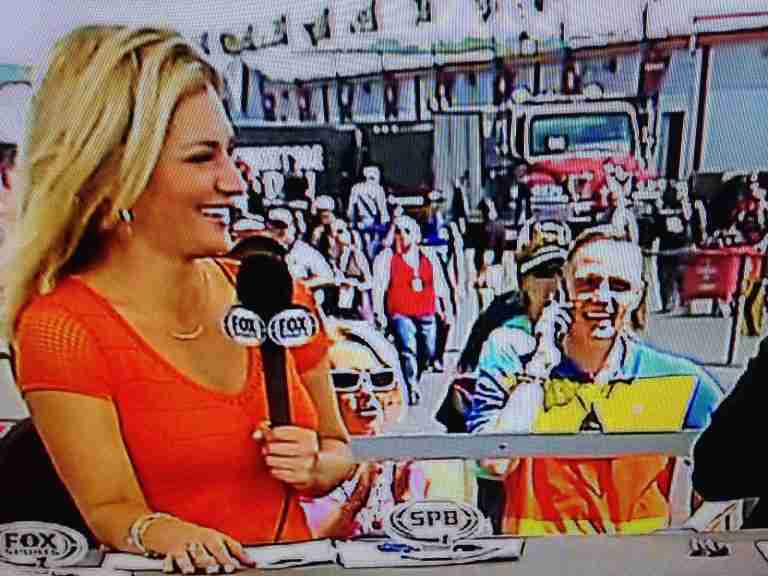 So, you casually walk up behind host Danielle Trotta and try to avoid being like every other jerk in the exact scenario on live TV, ever. 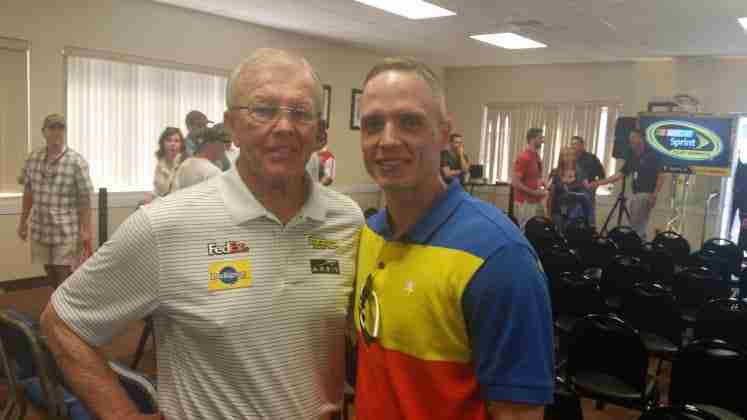 But the shirt you’re wearing is the loudest shirt at the entire Talladega Superspeedway. And it happens to be the same shade of orange as Danielle’s blouse. You’re quickly down in the count 0-2. “Pop quiz hot shot: What do you do? What do you do?” I pulled out my phone, called my seven year-old daughter Fiona and told her to turn the TV to Fox Sports 1. The first words out of her mouth were, “Dad, you’re wearing the same shirt as that lady!” And what could I say? Other than, “I see you were able to negotiate that tricky DirecTV remote successfully for the first time in history, other than when “Jessie” is on the Disney Channel.” She was right. “Dad, touch your nose. Now, rub your forehead. Now, take off your sunglasses. Now wave.” She giggled almost as much as I did. Just when I thought I had pushed my “real-a-meter” into the red for the day, another stroke of good luck struck. I was walking along pit row capturing images, wishing I could get onto the track for a few shots, like I had previously at Atlanta Motor Speedway and at Martinsville Speedway. But guarding the lone entrance was an enormous, pissed off, swollen bouncer regulating the flow of human beings who tried to enter the track without an additional credential on top of the Hot Pass called a “Hard Card” (go ahead and snicker, I did too). And I wasn’t going to test my luck. But then, luck tested me. Just like the Summer of George “Seinfeld” episode where Kramer was swept up in the excitement of winning a Tony and accepting an award he had nothing to do with while working as an audience seat-filler, I was swept up in a crowd of roughly 30 high school students allowed on the infield to display the largest American flag I have ever seen. I haven’t passed as a high school student for 15-plus years, so it was especially gratifying. It wasn’t even noon yet and the day had exceeded my expectations. 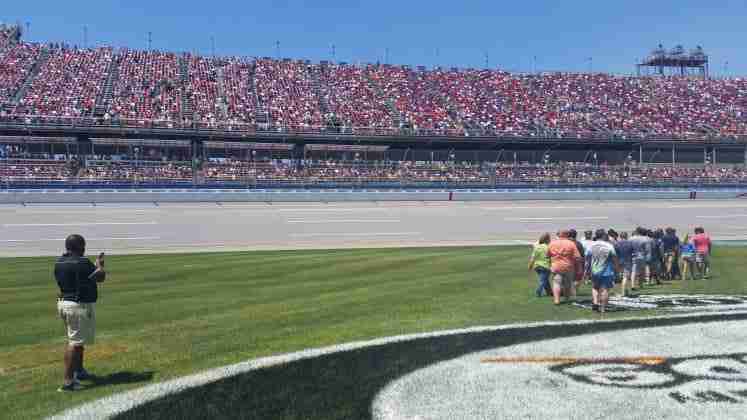 Once the race started, the Dale Jr. fans were out in full force. 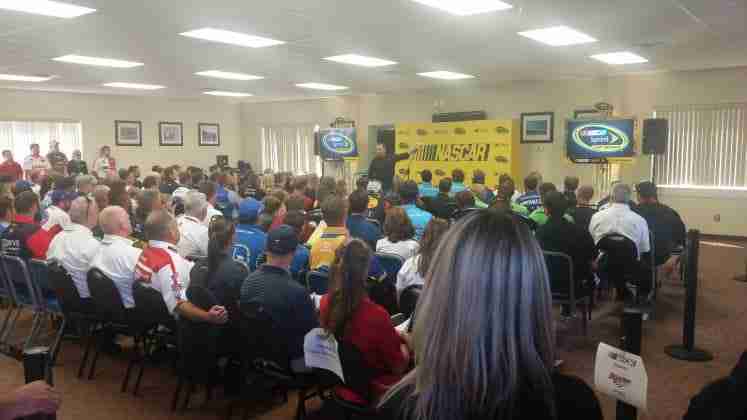 He is completely beloved at Talladega. 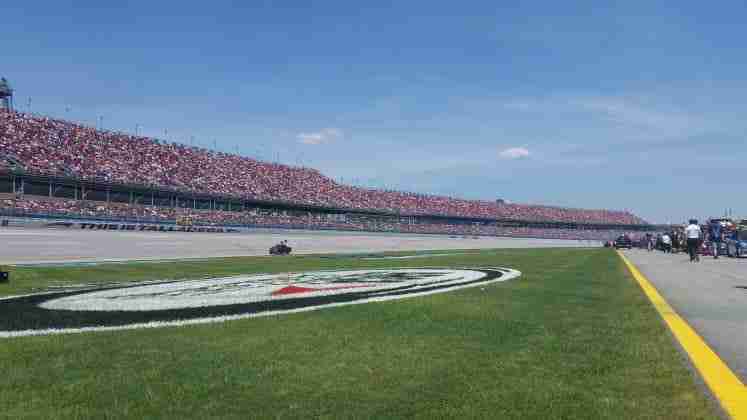 One of the coolest things in NASCAR is watching the crowd stand and erupt when a fan favorite takes the lead, specifically the 88 car on this day. But for as good as Dale’s day was, mine was better, and it finished in grand fashion. 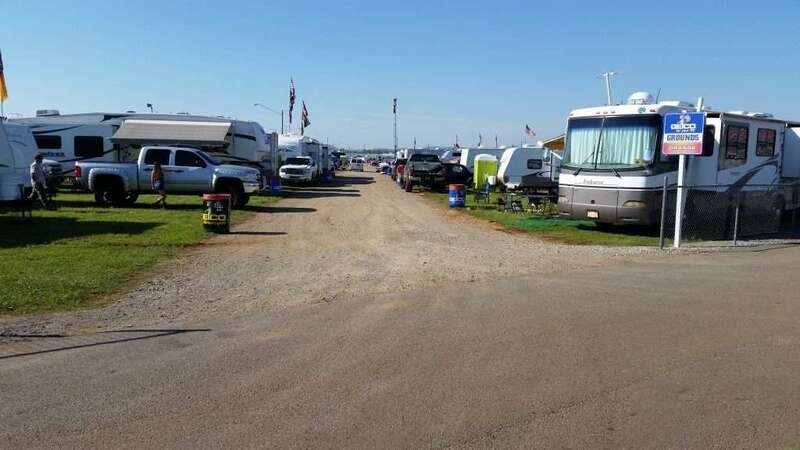 To exit the middle of the track, we had to walk completely to the other side of the superspeedway, through a sea of motor homes and campers that had taken up weekend residence, which still littered the interior grounds of the track, the last vestiges of the three-day rager that is Talladega. After making it the full distance, we exited the track through a tunnel that spit us out onto the notorious Talladega Boulevard. As we attempted to coordinate the meeting point with our driver “Big Ed,” I made small talk with one of several sheriffs on traffic detail as fans excited the track. 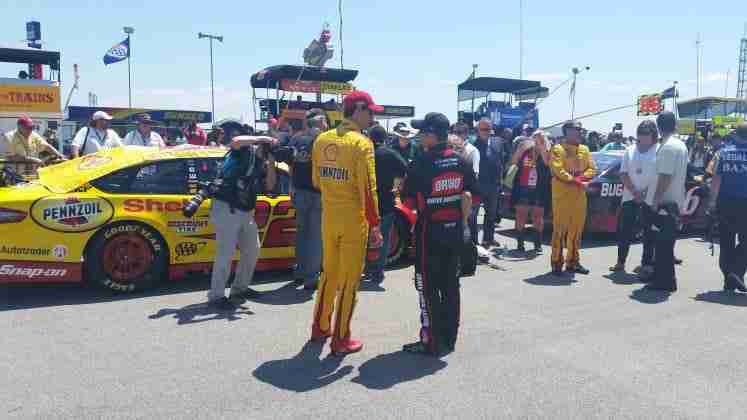 As with everyone I met at ‘Dega, he was as nice as he could’ve been. He asked where I was from, if I enjoyed the race, how I had been treated, and how I was getting home. When he found out I was from Nebraska, he told me about his time in the service and reminisced about two guys he served with from Omaha. Suddenly, our crew was on the move again, walking up a hill, telling fart jokes. So I shook the sheriff’s hand, thanked him and walked away. Several minutes later at the top of the hill, a sheriff’s vehicle pulled up and parked itself right in front of us. As the door opened, we all shared a sigh of relief when I realized it was the same sheriff from the bottom of the hill. “Why don’t y’all hop in the car and I’ll give you a ride,” he said, as he emerged from the vehicle. I like to think the Omaha connection sealed the deal. But April Rose, the epitome of all things feminine and good on this earth, likely made it happen. So now, I’m in the front seat of a police car for roughly two miles which we would’ve otherwise walked, sitting next to possibly the nicest person on earth, while easily the best smelling woman in Talladega and one of the most beautiful women on earth is sitting on my lap. I floated several cheese-tastic lines towards April, while simultaneously imploring the driver to “keep driving, please take the long way.” Things like that don’t happen in Nebraska. It was at that point I realized this was the best day I ever had, in the entire 21 years (sike) of my life. Which made Vanilla Ice and all of Whatever, USA, the previous #1 in the AP Coaches Poll, sob uncontrollably. Let Speed Stick show you how to have the best performance of your career on the track, with hot babes, or in your day-to-day life by using the hashtags #DefyTheDoubt and #SpeedStick. Check out their website, Twitter account and YouTube channel. Visit Cole Whitt’s website, and follow him on Twitter and Facebook. Check out April Rose, easily the most attractive woman in all forms and facets on earth right now via her website, Instagram, Twitter and Facebook. Tell her Paulie E sent you.